First, we need a piece of cardboard. Heavier than earrings, the thicker the board, but in any case he must have at least a half-millimeter in thickness. Drew a rectangle on the sheet. To make the small stands of the same size as mine (there fit 12 pairs), the length of it should consist of three parts of 8, 10 and over 8 cm and a height of 5 parts of 2,5 cm words obtained by a rectangle 18 * 12.5 cm Now step back 2 cm to the right and left, and draw the dotted line.We find the middle of the first, third and fifth horizontal lines, the resulting rascherchivaniya rectangle on the side.And draw from these seredinok horizontal line to the dotted line. 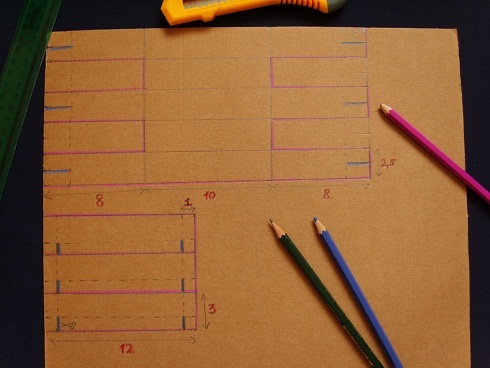 You also need to draw a rectangle of 12 * 9 cm and divide it into three equal horizontal parts. Then back right, left and bottom of each of the resulting rectangle to 1 cm, and to the dotted line. Colored lines on a photo show that you want to cut. Crimson represent the contour of parts, and the blue seats of the cuts. You should get something like the photo below. One big piece, and three young children. 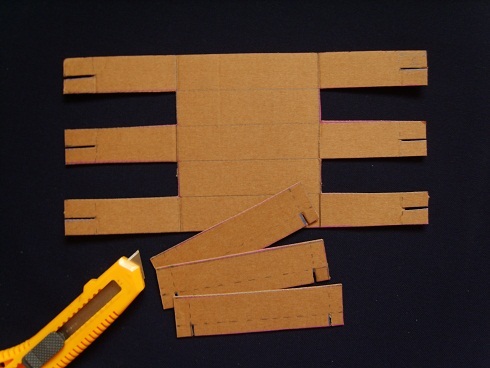 Sections, which were shown by the blue line, to do equal the width of the thickness of cardboard to details could enter without distortion into each other. 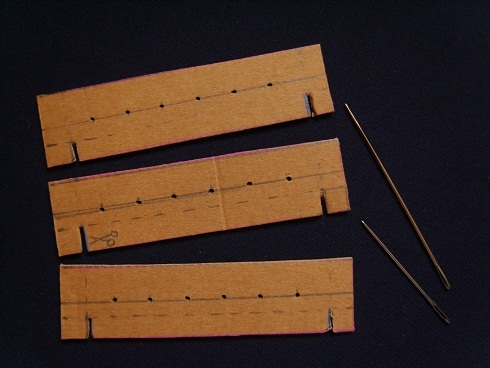 Then divide the small details in half horizontally and pierce a thick needle holes as much as you need. 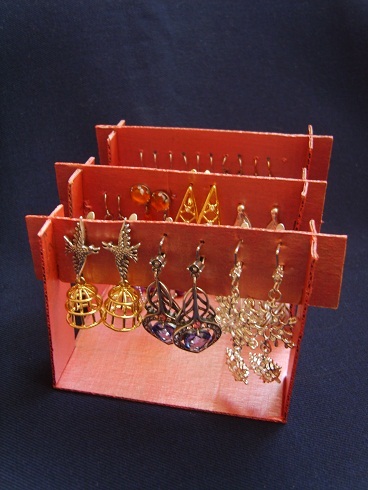 I have pierced 3 pairs of 2, but hung up when three pairs of earrings, it was found that fits all. Then the details need redecorated. I was eager to assemble construction soon and see what happens, so I just painted the canvas with acrylic paint on both sides. But we can do smarter, and close cardboard thin slices with a tissue, using the technique of decoupage, for example. In general, at this stage, decorate things, as the head vzbredet and give it to dry. But then again pierce holes, because the paint could close them. In fact, you could not pierce them at the last stage, and only do it now, but I had not guessed, when masters sample. But since you can store smaller ornaments. 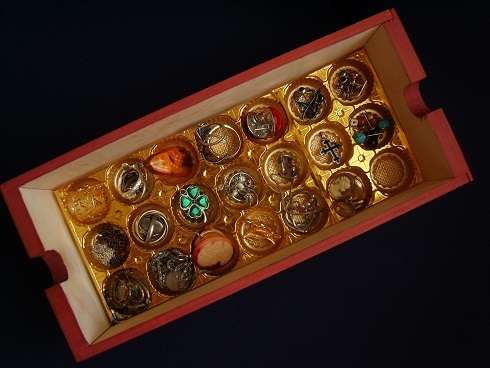 Out of the box of chocolates, I took the plastic cell, cut them in the form of a drawer and inserted into it. Easier to nowhere, and so convenient!